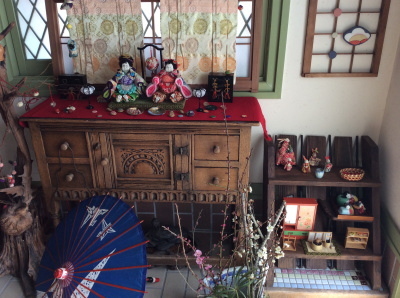 You know that March the 3rd is the Doll Festival Day. 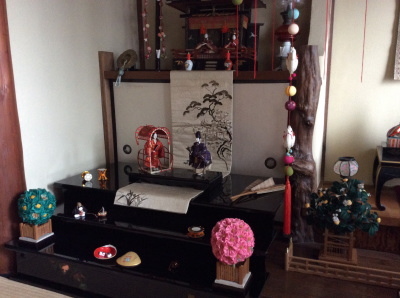 Hina Matsuri in Japanese. So, March is a special month for girls and girls-at-heart. 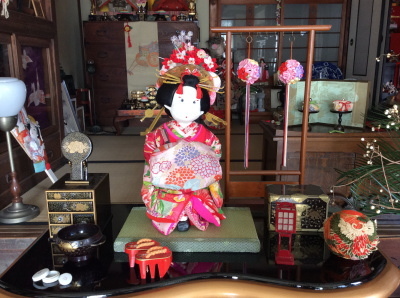 In many cities, there are several events related to the Doll Festival. 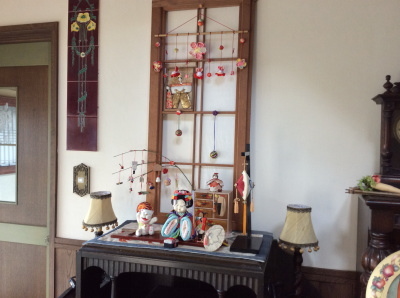 My friend Setsuko Yamamuro opens her house to show her marvelous collection of Hina dolls. 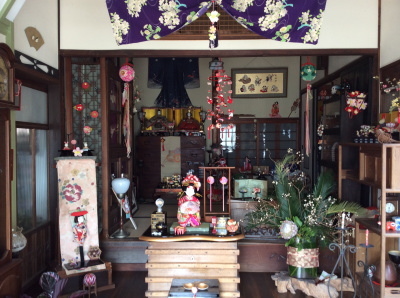 She lives in Okayama, far from Karatsu. 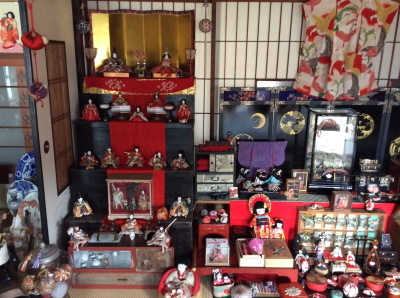 How I wish I could visit her house to see her dolls. So why don't you join me now to visit her house on this web page? My father took me to antique markets when I was just a small girl. This fond memory made me an antique collecter later in my middle age. 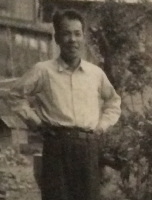 My husband's father, whom I could not meet while alive, left us an old house. 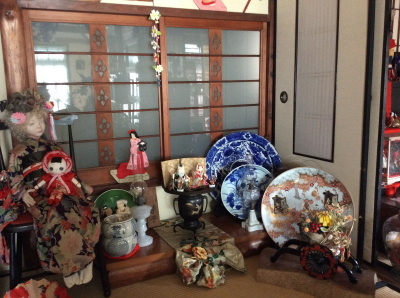 We decided to reform this house and use it as my show room of the collection. I owe my two fathers what I am now. 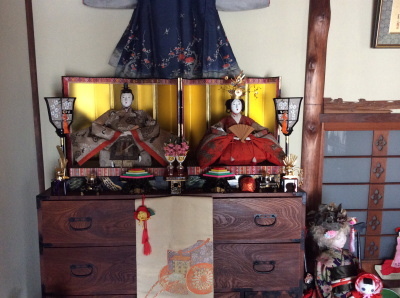 Both are now in heaven but I am sure they are happy to see my hina dolls.I hope you will enjoy my dolls too. 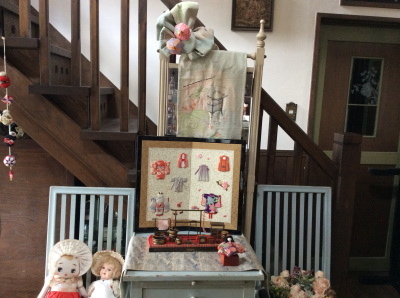 Sakura-bisque dolls were made in Japan about 100 years ago, imitating French dolls. An antique hall bench from England. 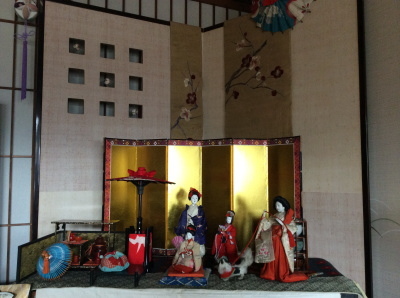 This happy couple is made by Kiyomi Nakashima, a doll artist in Karatsu. 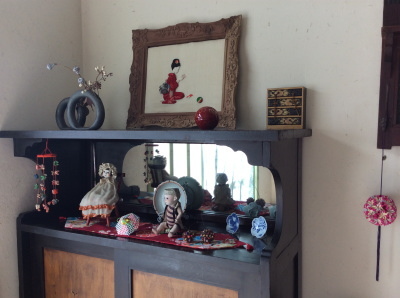 This doll is also a work by Kiyomi Nakashima. When you open the front door, you see this! 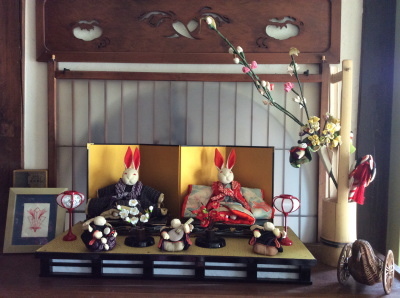 Rabbit hina dolls from Kyoto and Shikoku. 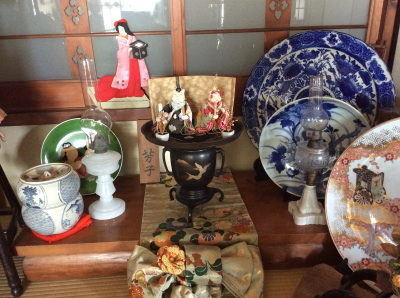 My biggest hina dolls. About 100 years old. 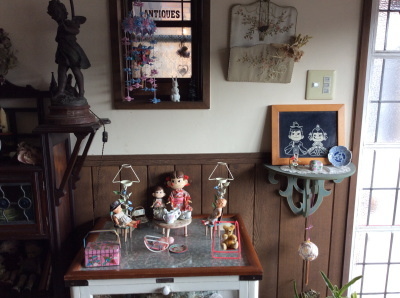 The doll at the left end has a western face. She wore a western dress originally, but I changed it to an old Japanese child's kimono. 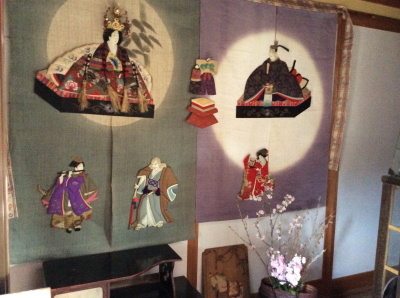 Can you see mice on their kimonos? The right are hair accessories of young women and small girls. 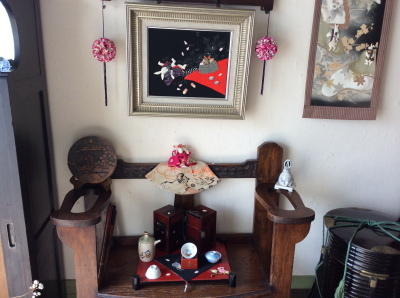 Above is my own embroidery scroll of hina materials. 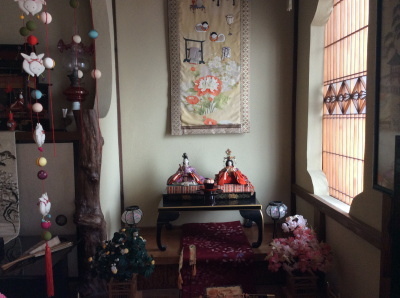 On the shelf, a palace of hina dolls. Samplers of how to tie the Obi. 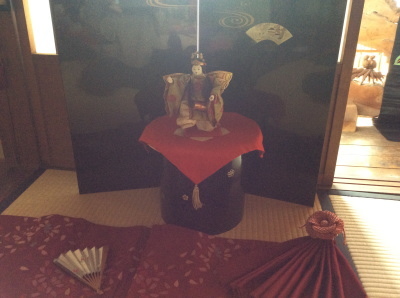 A famous doll artist's Ichimatsu Doll. 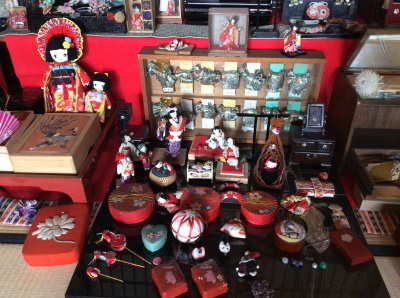 Small items to join the doll festival. 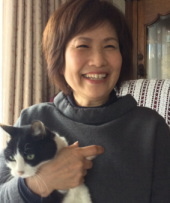 Kiyomi Nakashima's girl in her best kimono, and a happy cat with her. Peco-chan and Poco-chan are long-loved characters of pastry shop Fujiya. 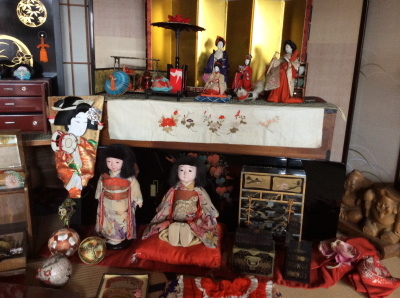 About 100 years ago, Japanese girls had these dolls for the first time. How happy they must have been! 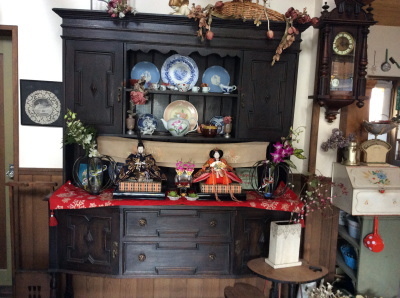 On this antique cupboard, hina dolls for my daughter sit. 2 rice bawls. 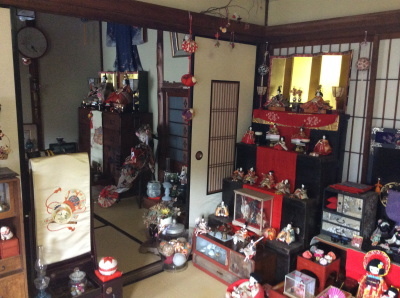 On top, do you see tiny little hina dolls? 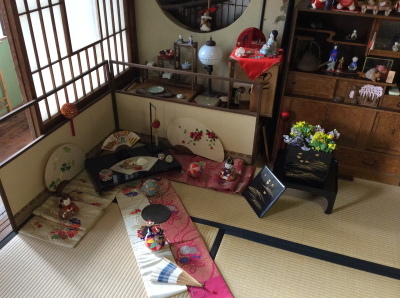 Oshie hina dolls from Meiji Era. 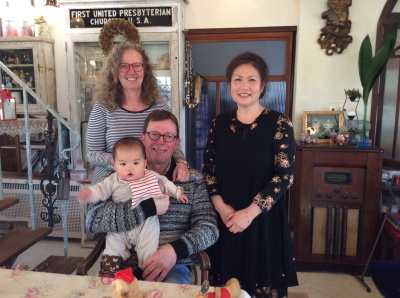 A couple from Denmark visited Okayama to see the new born baby. 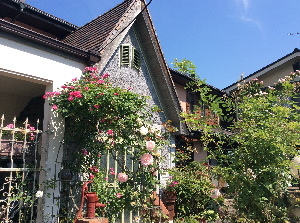 They were the host parents of the baby's mother when she studied in Denmark. 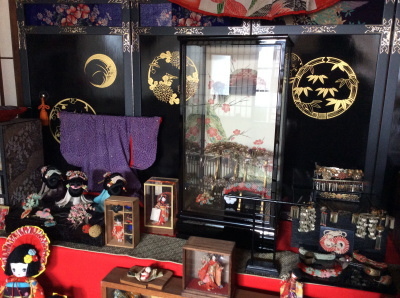 They liked my hina dolls so much. 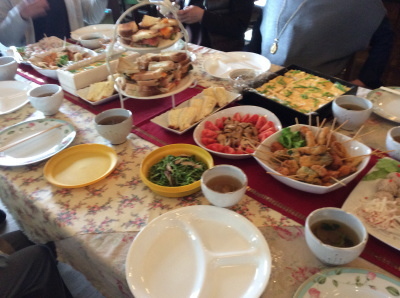 For the hina festival, I prepare these food. We go back to our girlhood, and enjoy our party. 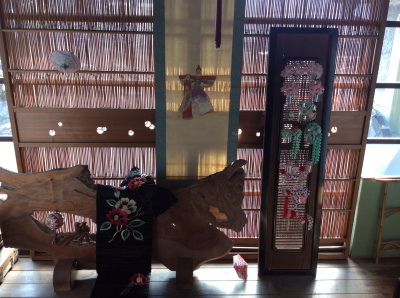 Well, how did you like Setuko's Hina Matsuri? I went back to my days of 10 years old. 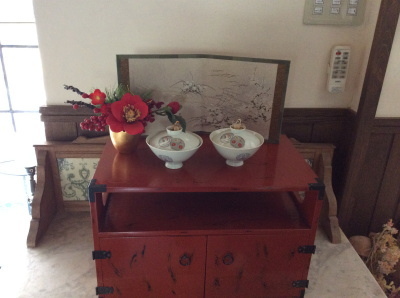 My mother and grandmother were with me. It was a warm and sweet feeling. I wish you the best for your fond memory.